Last week, the CXApp traveled across the world for a global affair. Over 2,200 customers, partners, and employees came together for a chance to impact the direction of mobility, data security, and IT solutions. Our team's adventure began in San Francisco, California. After a roughly 16-hour journey, we reached our final destination: Bangkok, Thailand. 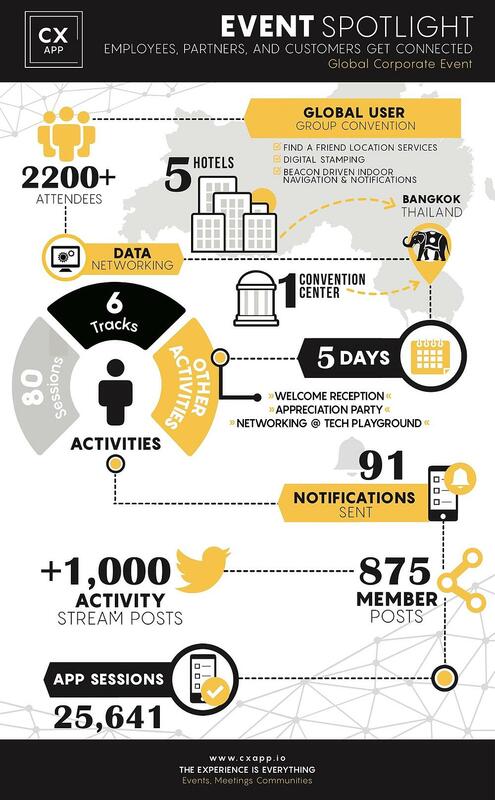 Through the use of strategic push notifications, we brought together attendees lodging in five different Bangkok hotels to the Convention Centre for an event to be remembered. Attendees started their experience with a packed agenda, tailored to their specific event group (training, partners, hospitality, and much more). Next, they were able to get the lay of the land through the “Live Map” section of the app; each guest navigating him/herself through 100,000 sq. ft. of meeting rooms located in the event venue. With this information in hand, the attendees was prepared to immerse themselves in the various demos, meetings, and trainings that were held during the week. For this event, we deployed a new section in our platform called “Stamp Rally.” Through this system, attendees were able to collect digital stamps after every session and turn them in for a prize in the “Tech Playground.” This “Tech Playground” also served as a space where partners (software venders) were able to demonstrate solutions they had built on top of our client’s technology. At the end of the week, the event culminated with an Appreciation Party, where guests enjoyed authentic Thai food, dancing on a 360-degree stage, and a display of Muay Thai (aka Thai boxing). We can’t wait to see what our client has in store for 2019!